James Quinn’s Young Ireland and the Writing of Irish History is a fascinating look at a group of ideological intellectuals who sought to make the rest of 19th century Ireland as interested in the country’s history as they were. The purpose of this mission was not for the sake of history itself; indeed, the Young Irelanders, as these men became known, were as contemptuous of overly dry works of impartial scholarship as they were of textbooks aiming to make the Irish into better Britons. History, as far as they were concerned, was there to excite, to arouse passion and, ultimately, to inspire its audience into becoming better patriots. Orwell had yet to say: “He who controls the past controls the future,” but the Young Irelanders had already come to that conclusion. 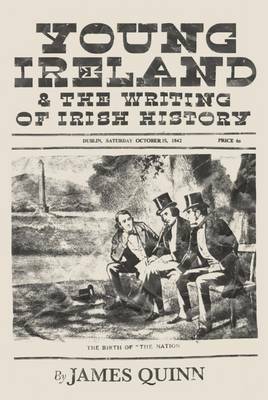 With that purpose in mind, the Young Irelanders founded the Nation newspaper in 1842 to publish heroic tales of derring-do, the more battles the merrier, and with an emphasis on ‘great men’ such as Owen Roe O’Neill, Hugh O’Neill and Patrick Sarsfield. In this, they were drawing much of their inspiration from contemporary Romantic writers such as Thomas Carlyle, Jules Michelet and Augustin Thierry, as the Young Irelanders were the first to admit (though the anti-Irish snobbery in Carlyle was best ignored), and the Romantic movement in general, which celebrated the past as a source of inspiration, as opposed to the more forward-thinking and self-consciously progressive thinking behind the Enlightenment a generation before. A strength of this book is Quinn’s skill at providing the intellectual context in which the Young Irelanders thought and wrote, both within Ireland (the Young Irelanders were happy to take advantage of works by more apolitical Irish antiquarians to buttress their own research) and on the Continent, where nationalists were similarly eager to uncover the true soul and essence of their countries through history and folk culture. However, Quinn is careful to avoid cluttering his narrative with excessive detail on side subjects, with the focus remaining on the Irish scene. Besides the Nation, the other great literary project of the Young Irelanders was the Library of Ireland book series, beginning in 1845 with the publication of History of the Volunteers of 1782, and followed by other books on subjects such as the Nine Years War, the Plantation of Ulster and the Confederation of Kilkenny. Envisioned as a collection of interlocking chapters on Irish history, the Library of Ireland went on to exceed all sales expectations, with several of its titles appearing on R. Barry O’Brien’s ‘100 Best Irish books’ in 1866. The Young Irelanders’ mission of education was overtaken by events such as split with Daniel O’Connell over use of political violence and then by the Famine. Nonetheless, the Young Irelanders held a moderate line, repudiating proposals like a national rent strike. This angered the more radical members such as John Mitchel who proceeded to set up his own newspaper: United Irishman. As the title would suggest, Mitchel had no problem with the notion of armed insurrection, with the United Irishman helpfully giving tips on the best way to construct a barricade or drill with a pike. The government’s severe response to this increased militancy (such as the sentence of fourteen years of transportation for Mitchel) prompted the ramshackle Rebellion of 1848 though, as Quinn argues, the hero-worship of past revolutionaries such as Robert Emmet (true to form, Mitchel chose Emmet’s brother-in-law as his defence counsel at his trial) made the decision to follow in their idols’ revolutionary footsteps an inevitable one. A depiction of the Young Irelanders’ failed rebellion in 1848. Despite the end of the Young Irelanders post-Rebellion as a coherent group, many of their leading members continued on with their mission to present and propagate an acceptably pugnacious view of Irish history. Additionally, having propelled themselves into a role of their own onto the historical stage via the 1848 Rebellion, they were keen to defend it, depicting the uprising as essential, O’Connell as an untrustworthy opportunist, the Famine as a British plot, and each other as either uncontestably virtuous (if they were still friends) or as miserable rogues (if they were not). It was at this post-mortem stage that the Young Irelanders achieved their greatest success, for in many ways the subsequent generations were to follow their lead in writing history. Mitchel’s Jail Journal was to provide the template for the prison memoirs of the likes of Jeremiah O’Donovan Rossa, Michael Davitt and Thomas Clarke. O’Connell’s reputation struggled to recover from the polemics against him (the centenary of his death in 1947 was to be a muted affair), and the idea of the Famine as a plot as much as a natural disaster has been passed down through historical works as recent as Tim Pat Coogan’s 2012 book. The Young Irelanders’ greatest success was in popularising a nationalist narrative of Irish history. This book is a tight, impartial but appreciative history of their ideas. The turn of the 20th century was to find an Ireland which readily responded to Young Ireland’s telling of history as a call to arms: an officer in the Mayo IRA during the War of Independence remembered his father reciting Mitchel’s History of Ireland “off by heart.” The first history book Éamon de Valera ever read was Alexander Martin Sullivan’s Story of Ireland, while Arthur Griffith’s United Irishman owed inspiration for its title as much to Mitchell’s original newspaper as to the 1798 participants. This is a short book at only 147 pages, not including the extensive bibliographic notes, but Quinn keeps his narrative a tight one, making every page and paragraph count. This is a story of ideas, not of events (the 1848 Rebellion is told in barely a paragraph) nor of people (though there is a list of biographies at the end to help the reader keep track of who’s who), and Quinn is well able to explain them, and the motivations of the men (they were overwhelmingly men, no Countess Markieviczs here) who nurtured them, spread them as best they could and, in the case of those exiled or imprisoned, suffered for them. Quinn is very much not a writer of the Young Ireland school, keeping as he does his tone admirably impartial as befits the Managing Director of the Royal Irish Academy’s Dictionary of Irish Biography. But towards the end, he lets slip a glimmer of admiration at the Young Irelanders’ achievements. It is hard for even a cynical reader to not feel likewise. For better or for worse, 20th century Ireland was as much a product of the Young Ireland movement as anything. This book should do much in making this team of intellectuals, pedagogues and would-be revolutionaries better known.